The Monday Evening Book Club will meet in the Training Room on October 1 6 at 7 pm. 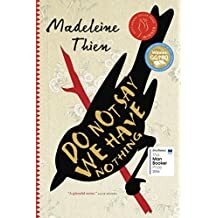 This month we’re discussing Do Not Say We Have Nothing by Madeleine Thien. The Monday Evening Book Club will meet in Forsyth Hall on January 9 at 7:00 pm. Our pick this month is The Prison Book Club, a memoir by Ann Walmsley. An attack in London left journalist Ann Walmsley unable to walk alone down the street, and shook her belief in the fundamental goodness of people. A few years later, when a friend asked her to participate in a bold new venture in a men’s medium security prison, Ann had to weigh her curiosity and desire to be of service against her anxiety and fear. But she signed on, and for eighteen months went to a remote building at Collins Bay Institution, meeting a group of heavily tattooed book club members without the presence of guards or security cameras. There was no wine and cheese, no plush furnishings. But a book club on the inside proved to be a place to share ideas and regain a sense of humanity. Ann Walmsley is a magazine journalist whose work has appeared in The Globe and Mail and Maclean’s. She is the recipient of four National Magazine Awards and a Canadian Business Journalism Award. In November 2016, Walmsley won the 25th annual $10,000 Edna Staebler Award for Creative Non-fiction for The Prison Book Club. The Seniors Book Club will meet on Wednesday, January 11 at 2:00 in the Training Room on the second floor to discuss Annabel by Kathleen Winter. Annabel was shortlisted for the Scotiabank Giller Prize, the Governor General’s Award for Fiction, and the Rogers Writers’ Trust Fiction Prize. It was also a finalist in the 2014 Canada Reads competition on CBC Radio. Born in the north of England and raised in Newfoundland, Winter began her career as a script writer for Sesame Street before becoming a columnist for The Telegram in St. John’s. She is the author of a short story collection entitled boYs, her first novel Annabel, and most recently, a nonfiction book about the north entitled Boundless: Tracing Land and Dream in a New Northwest Passage. Kathleen Winter was a member of the jury for the 2016 Scotiabank Giller Prize. She lives in Montreal with her husband and daughter, and is the sister of novelist Michael Winter. The Seniors Book Club will meet in the 2nd floor “Training Room” on Wednesday, October 12 at 2 pm. Our pick this month is The Prison Book Club, a memoir by Ann Walmsley. An attack in London left Ann Walmsley unable to walk alone down the street, and shook her belief in the fundamental goodness of people. A few years later, when a friend asked her to participate in a bold new venture in a men’s medium security prison, Ann had to weigh her curiosity and desire to be of service against her anxiety and fear. Susan Juby takes home the 2016 Leacock Medal for humour writing for her novel Republic of Dirt. When Prudence is felled by a thyroid condition, things on the farm begin to fall apart, resulting in valiant and sometimes ill-advised attempts to restore domestic bliss. Efforts are complicated by a renegade mule, attempts to turn a hideously ugly child’s playhouse into a high-yield roadside farm stand, and an electrical station’s worth of crossed wires. Will Prudence get well? Will Seth finally get rid of his pesky virginity? Will Earl rescue Sara? And will anyone, ever, admit they might be wrong?